The purpose of this article is to explore and explain the nature of wet grinders. These machines are mostly used for preparing Indian dishes (dosa, vada, etc. ), but more on that in Buyer’s section. In this article, we will provide you with products table, where you can read summary if each product we reviewed. This will be followed by in detail product descriptions. After that, you will go through our buyer’s guide, where we explain and explore the benefits of using a wet grinder. Also, we will explain what you should look for if you are planning on obtaining this device. We hope this article will help you find some new things about wet grinders, and that it will help you make the optimal choice if you do decide to purchase a wet grinder. Ultra Dura+ Table Top Wet Grinder is stylish, modern looking grinder that will blend in most contemporary kitchens. The product features powerful rotor, made of stainless still, highly durable and capable. Upon purchase, you receive a 1-year warranty on the product and 5-year warranty for the motor. This particular model has the 1.25-liter capacity, is very compact and lightweight. The product is 17.5 x 11.5 x 12 inches big and weighs roughly 25 pounds. Thanks to its sleek and compact design, this wet grinder saves space and is very portable. Grinding stones are designed to emit less heat, and feature fluffy idlis to grind with precision and care. The motor is robust, durable, quiet and rapid, and will prepare dishes like Vada, Dosa and those alike with ease and perfection. The product itself is made partly in the USA and partly in Canada, and as such inspires confidence amongst consumers. Apart from stainless steel rotor, the product is made of food grade plastic and rustless material. Due to quality design, the Ultra Dura+ Table Top Wet Grinder won’t make loud noises or vibrate as you use it. When it comes to performance, we suggest that you grind the harder food first, and then softer food. Also, make sure you add enough water as you prepare the dish, or the rotor will have a hard time rotating. This isn’t unique to this piece, but rather general advice on how to use smaller, compact wet grinders. If you follow this advice, the grinder will do an excellent job griding the food. The end product will be soft and tasty, assuming you combined the ingredients you like. If in need of compact, stylish wet grinder, Ultra Dura+ Table Top Wet Grinder is certainly a valuable option. However, customer service is not the manufacturer’s most prominent feature. We also don’t like the fact that arm unlocks or detaches as the grinder works. Other than this, we have no complaints about this product. It runs efficiently and silently and will make your dishes smoother and tastier. It is also stylish and beautifully designed. It features stylish design, and as such will fit in any modern kitchen. In fact, it will probably improve the overall appearance of the kitchen, giving it a dose of modernity and technology. Drums are made of stainless steel, meaning the won’t oxidate and rust. The stainless steel makes them very easy to maintain and also prolongs the products durability. The drums can also act as a quality storage unit for the batter. This grinder is powered by a robust and efficient motor (150 Watts). It works swiftly and silently and grinds the food evenly without overheating the food or the grinder. The motor will keep its pace until you are satisfied with the result. This grinder features conical grinding stones. They are designed to produce less heat while grinding. Due to this unique conical stones, the grinder with grind with lower temperature and higher fermentation rise. These conical stones are both efficient and boost productivity, allowing you to make softer and fluffier food (such as idlis). When it comes to maintaining, this product features integrated batter remover, allowing you to clean with ease and comfort. You will quickly remove the batter from the grinding stones. We do like the multi-purpose drum, which can act independently of the grinder. You can make the batter in this drum, separate it from the grinder and store in the fridge. You don’t have to store it in another vessel, which is convenient. This grinder also comes with Atta Kneader, which you can use for preparing dough based dishes. Kneader does a fantastic job at processing the dough, but not on high-level, professional level. Still, it is perfect for home use and is an extra device that you’ll surely use. The downside of this product is, for starters, the lack of instruction manuals. Many people reported not receiving a manual or the manual being too hard to read. Also, the stones are smooth, perhaps too smooth. When using the grinder, slowly introduce ingredients and add water if the batter is too dry. 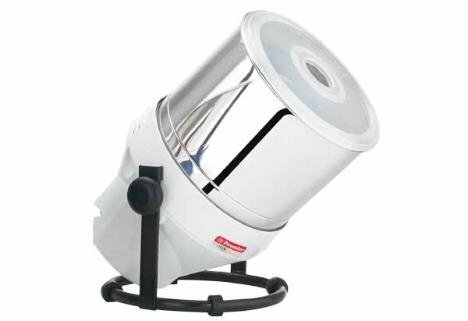 The grinder is made of high-quality food grade plastic, while the drum is made of stainless steel. Upon purchase, you will receive coconut scraper, together with the Atta Kneader. Since we already described the Atta Kneader while reviewing the previous product, there’s no need to explaining it again. This grinder shows its most prominent feature when grinding rice, beans or pulses, and other similar, smaller ingredients. It features new and advanced, double reduced gear drive technology. Thanks to the smart engineering and double gear drive feature, it will last longer than other, similar products (those that use belt-only drive machine). The drum is durable, compact and lightweight, made of stainless steel. You will also receive the coconut scraper for more comfortable and convenient cleaning. Though lightweight and compact, the Premier Compact Table Top Wet Grinder is very powerful (200 Watts) and has 2 L capacity. It is perfect for medium sized families, allowing you to control the quality of the food you eat. The device possesses strong grinding features thanks to the robust and sharp grinding stones (uses two grinding stones). Two roller stones press and compress the food evenly, allowing the ingredients to omit their substance in the natural, yet modern way. This machine produces soft and tasty batter in short time but still works at the optimal pace and power to avoid overheating. Ingredients will pertain their nutritional value thanks to the smartly engineered grinding stones. Premier Compact Table Top Wet Grinder is certainly a valuable option if you are looking for 2 L, durable, quiet and effective grinder. If you do experience burning smell at first, it is mostly because the motor wasn’t used over an extended period. The only problem we have with this machine is cleaning. The batter will penetrate into the hollow tube, which may be hard to get when you try to clean. Also, the warranty policy is somewhat unclear, so make sure you do receive it, written and in the paper to protect yourself from potential defects. 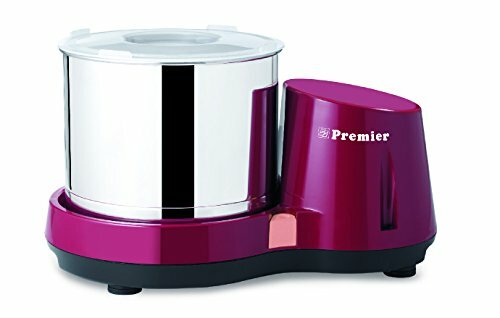 Premier 2.0l Tilting Wet Grinder is extremely compact(12.4 x 12.3 x 18.3 inches), and extremely lightweight wet grinder(16 pounds). Let’s start with the design. The tilting feature allows you to pour the batter, pastes and similar food straight out of the drum, without the need for removing it. Still, you have the option to remove the drum if you feel that tilting feature is not for you. It is also very easy to clean and maintain, thanks to the products compactness and tilting feature. Maintaining is also easy thanks to the stainless steel design and top quality food grade plastic. This grinder uses two grinding, rolling stones to slowly but surely grind the ingredients at optimal speed and heat. It won’t overheat, and thus will preserve nutritive value of the ingredients. The grinder will also ensure that there is no chipping as it grinds the food. Like the previous Premier grinder, this one also features dual compression gear drive, assuring maximum durability and productivity. Upon purchase, you will also receive dosa ladle, made of stainless steel, together with Atta kneader. Though the product features stylish tilting design, tilting isn’t optimized for different angles. It’s somewhat bulky and uncomfortable to use. I commend the idea, but the practice wasn’t done correctly. Also, the grinding stones are too close to the base frame (there is no space between stones and the frame), which may cause stretching and minor damage to the grinder. Apart from this design flaws, the product works tirelessly, quietly and efficiently. It is quality made, and you will be able to use it over an extended period. Made by SS Premier, this Small Wonder grinder fits in most contemporary kitchens (not all though, because of the blue coloring). It is compact, being 11 x 11 x 16 inches big, and weighing roughly 27 lbs. Like other Premier wet grinders, the drum is made of stainless steel, with the addition of food grade blue plastic parts. Upon purchase, you receive Atta kneader, together with coconut scraper for more convenient cleaning and efficient kneading. Also, like two previous grinders, this one also used double gear ride technology, which helps prolong the grinders durability and helps with more efficient and smooth grinding. 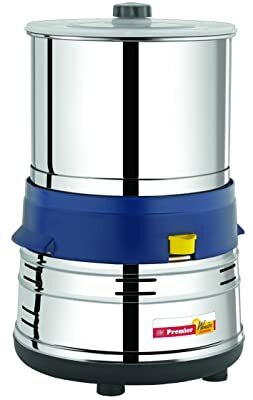 This grinder offers 1.5 L capacity. Though it is designed for home use, this particular grinder is suited for commercial use. It performs very well under extreme conditions over a long period, mostly thanks to the smooth grinding. It doesn’t overheat, which not only helps in food preparing but also helps the machine stay in operational form. Also, this product is not expensive, considering its performance and durability. It also features beltless design, which helps the machine produce less noise while working. This is even more helpful for commercial use because even if you use several of these machines in one room, you still won’t mind the noise. 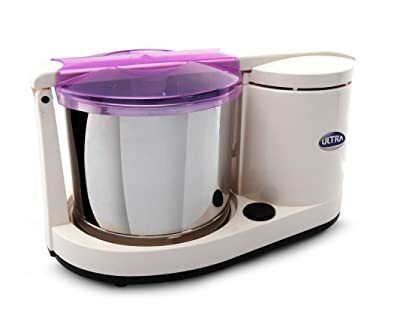 Most customers use this machine to make chocolate, butter, idlis (very fluffy when made with this machine), and so forth. We do commend the products amazing performance and robustness, even under heavy conditions. The design is neat, compact and straightforward, allowing you to save space and time as you use this machine. We also commend the almost noiseless performance. Again, we strongly recommend that you pay attention to instruction manual if you do decide to purchase the wet grinder (this is worth for this and every other wet grinder). Furthermore, make sure you receive warranty. Contact customer service before ordering and arrange warranty. The only downside we had with this machine was the spring beneath the plastic frame (the one that holds the grinding stones) is somewhat stiff and inflexible. We feel that grinding would have been perfect if design flaw had been resolved. But other than this, the product works perfectly (my personal favorite). As we stated at the beginning of our article, in this section, we will discuss the benefits of using the wet grinder. More importantly, we will stat what things you should look for if you do decide to obtain one for yourself. The key is to find the balance between fermentation and temperature, and that is what the modern wet grinder manufacturers are trying to achieve. But why would you buy a wet grinder if you can obtain batter in the store? Well, you can buy almost anything these days, right? Investing in wet grinder means that you will have total control over the production: you control the pace (more or less), you control the ingredients and the manufacturing process. This means that you will not only produce healthier batter but also more delicious. To do that, you need the wet grinder that will not only perform well but the one that will suit your requirements and wishes. How do you select one? Well, below we will outline some of the most important features you should look for. Though most of our reviewed wet grinders are tabletop grinders, we also examined one tilting grinder. In essence, tabletop grinders are suited for homeowners. They frequently feature 2-3 grinding stones, which are usually cylinder like or conical. The difference among our products is the capacity. 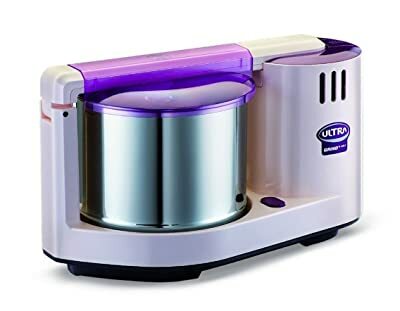 Some machines can hold 2 L, while others hold 1.5 L. The Ultra Dura+ Table Top Wet Grinder is the smallest one, holding 1.25 L.
Mind that the capacity has nothing to do with the quality, nor that you should buy the one that has the most capacity. No. Instead, consider your needs. If you think you’ll benefit from 1.25 L machine, go for it. However, don’t judge by just looking at the holding capacity. You also have the tilting wet grinder, the Premier 2.0l Tilting Wet Grinder. Tilting allows you to pour the batter out of the drum with more comfort. They are also easier to clean and maintain. The difference is in the capacity. Also, some are more lightweight than others. Furthermore, some drums even act as independent of the grinder, in the sense that you can use it for storing and conserving butter in it, like the Ultra Grind+ Table Top Wet Grinder drum. Grinding stones come in two shapes: cylinder and conical. Usually, conical stones offer grant better griding capabilities because of the sharper edge, but this isn’t the rule. Conical stones give the ingredients less “escape space,” meaning that they will push the food to the edges and grind it with sharp edges. However, the Ultra Grind+ Table Top Wet Grinder features conical grinding stones, but these aren’t as sharp as I would like them to be. Also, sometimes you don’t want the sharpest stones. Cylinder rolling stones distribute the pressing weight evenly, and thus they compress the ingredients in an equal manner. The number of stones also plays an important role. The general rule says “the more stones, the better.” However, grinding stones impact weight, which might be a deciding factor for you. Furthermore, the more stones you have, the harder it is to maintain and clean the grinder. Then again, more grinding stones means that the grinder will take less time to grind the ingredients and produce softer batter. If you aren’t sure, we suggest going for the grinder with two grinding stones, a middle ground between one or three grinding stones. Wet grinders are made of stainless steel and food grade plastic. Pair that with grinding stones, and you got a recipe for heat. You want the grinder to heat, but not overheat, for it might burn the ingredients and destroy nutritive value. While using the grinder, turn it off if it starts overheating. No matter how well the design is, it will start overheating if you use it excessively. Make small pauses, and then turn it on again and continue the grinding. Generally speaking, the products we reviewed have no problem with overheating and noise. But, there are always nuances, so pay close attention to each product as you go through each product. Some of the products on our list come with Atta Kneaders, coconut scrapers, and ladles (stainless steel). Obviously, kneaders will grant you more convenient and efficient kneading, thus saving you time and ensuring that the kneading is correctly done. Coconuts scrapers are almost a must if you purchase fresh coconuts, meaning that you’ll have to clean them yourself. While this is very hard to do by hand, coconut scrapers do the job with ease and comfort. If you are new to the wet grinding world, don’t be afraid to use it. Firstly, don’t simply plug it in and start using it if you obtain it. Go through the manual, and if it is poorly written or you don’t receive it, contact the customer service. And if the customer service doesn’t help, you can always browse the internet, look for an instructional video or talk to people who have the same model as you have. Furthermore, don’t overload the grinder with food. If the batter is too dry, add water, but not too much water, for the batter might turn into too soft and gooey liquid. You want the mixture to be soft and compact, but not too soft or dry. Though we could talk a lot more about the wet grinder, we feel that we covered all the basics and some additional issues and features concerning these machines. We also didn’t discuss power supply; know that they are all manufactured for the USA and Canadian consumers. If you do enjoy Indian cuisine or wish to grind your chocolate, butter, soups or similar food, owning a wet grinder is of tremendous help. Electric tabletop grinders will automatically grind the ingredients at optimal pace and temperature, but you’ll still have to monitor the process, ensure that there is enough moisture and that the process isn’t overheating. Go through the buyer’s guide to find in detail information about the parameter and factors that you should consider before you purchase a wet grinder. And pay attention to details, because even the smallest detail can make a difference between satisfied and unsatisfied customer.